The Minister of Evil: The Secret History of Rasputin’s Betrayal of Russia is a very strange book. I read it because I’m researching Rasputin with the intention of writing some kind of disco-inspired novel about the man over the course of 2015. * I’ve read lots of books about him and disco already, closeted away in the British Library, so by now I have a pretty good idea of the basic facts of the man’s life, but also of the various rumours that different factions spread about him. His followers believed him sent from God, able to heal sick and see the future, whilst his enemies publicised the fact that he was a hard-drinking womaniser (which was kind of true), but also that he was a corrupt, spying, avaricious, traitorous mastermind who tricked and coerced the Emperor into placing the governance of Russia into his hands. Some went even further and said that Rasputin wanted control of the world, which he saw as achievable by assisting Germany to win the First World War and then worm his way into power of a Europe-wide state. This is what William Le Queux’s The Minister of Evil is about. The premise of this book is that Le Queux has translated, in late 1917 (only a year after Rasputin’s death), a manuscript sent to him by a Russian called Féodor Rajevski. 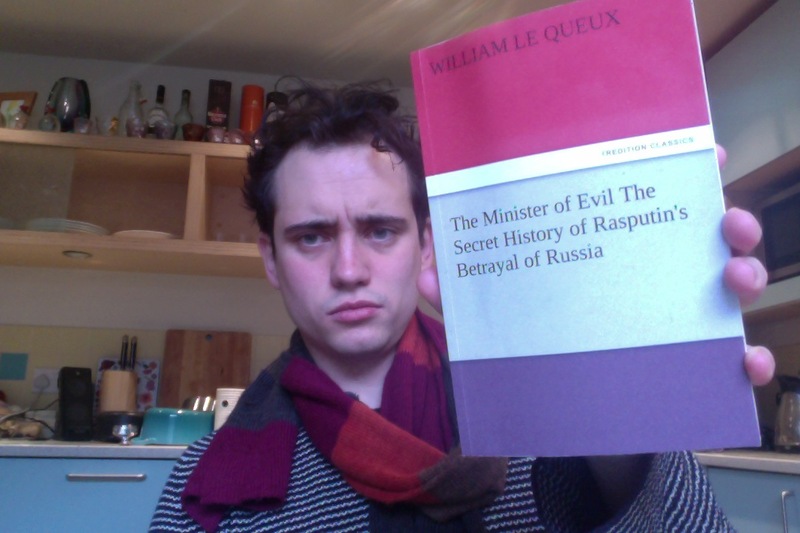 Rajevski was, Le Queux writes, the private secretary of Rasputin and present and a party to all of his murdering, treason and blackmailing, despite being repulsed by it and stopping his plans whenever possible. Rajevski didn’t exist, though. Le Queux – a writer of faux-factual political novels – made him up, as he made up (in my opinion) the vast majority of the narrative of his book. His Rasputin is sexist, is violent, is calculating, is illiterate, is both an idiot and a mastermind, is obsessed with money and is in constant contempt of everyone else he meets, deeply suspicious of all, yet unable to notice his secretary’s lack of approval of his actions. The text was written very quickly (Le Queux published ten(!) other books that year alone – bibliography here) and it shows. It’s full of contradictions – not just in the way people behave or think about others, but in terms of what kind of a document it’s meant to be. It runs off at tangents, it disappears into allegations about people who were still alive at time of publication, but also lists crimes and intrigues that I have come across nowhere else in my research and have to conclude are fictional. The book is presented as fact, but the fact that it ignores many of the most significant people and places from Rasputin’s life shows the gulf between secondhand-fact and true awareness. Rasputin’s wife is never mentioned, his most important mistress is missing, and his daughter – to whom he was very close – is also absent. Le Queux’s Rasputin hates women and sees them as tools to use in his manipulation of other men or in his gratification of his own humongous libido. I didn’t like this. I also didn’t like Rasputin as a traitor. Selfish, yes, alcoholic, yes, lusty, yes, arrogant, yes, greedy, yes, self-promoting, yes, cruel, yes, violent, yes… but he was also a man of deeply felt faith able to charm crowds and people with his words. He was charismatic and attractive to most people who met him, a voice for peace and for charity and for love. But he also loved to stay up all night drinking wine, dancing to gypsy bands and having orgies with the theatrical community. He was a complex and confused and deeply intriguing character, which is why I think he’d made such a brilliant subject for a (racy, discursive**) novel. In The Minister of Evil, William Le Queux reduces Rasputin to the status of a drunk villain, cackling as he orders arrests and has people murdered. There is nothing redeeming or charming about the Rasputin in this book, and there is no explanation for why he’s so popular. He just is. It is a fact Rajevski is unable to explain. Of the many books published in the years following Rasputin’s death that try to evoke a blinkered view of a divisive man, this one is the least informative of truth that I’ve read, but it is a valuable piece of evidence documenting that the British establishment wanted its people hating the post-Revolutionary Russians as much as it hated the Germans. It’s about war, whereas Rasputin was about peace. * Because a computer containing two unpublished novels just isn’t full enough!!! ** Because a computer containing two unpublished racy, discursive novels just isn’t full enough!! !